Saturday is a big day for the black and gold with two runners in graded stakes. Well-bred 4-year-old filly Berned is a live longshot in the first graded stake of the day, the $750,000 Ogden Phipps Stakes (G1). 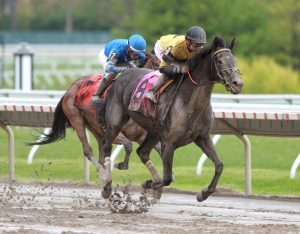 Trained by Graham Motion, she’s coming off a decisive score in the $75,000 Serena’s Song Stakes at Monmouth on May 12. Berned broke her maiden at Belmont Park at second asking before finishing second in the Tempted Stakes (G3) and going on to win two listed stakes. Purchased at the 2015 Keeneland September Sale, she’s owned by WPT, and longtime Partners Rob Masiello and Chris Larsen. Post time for the Phipps is 12:47 ET. Berned breaks from outside post 8 with Joe Bravo aboard. California invader Kanthaka seeks the third graded stakes win of his career in the $400,000 Woody Stephens Stakes (G2). The Jerry Hollendorfer trainee flew to New York on Tuesday and is settled in at Hall of Famer Shug McGaughey’s barn. By Jimmy Creed, Kanthaka is undefeated at the seven-furlong distance. After breaking his maiden in December, he won the San Vicente Stakes (G2) at Santa Anita competing in two Kentucky Derby prep races. The colt was then unstoppable cutting back to one turn, scoring in the Laz Barrera Stakes (G3) on May 12. 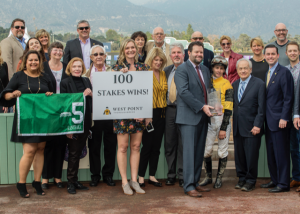 The West Point buying team purchased Kanthaka at the 2017 Barretts Sale held at Del Mar. By Jimmy Creed, he’s out of the Noonmark mare Sliced Bread. Partner John Haines named the colt after Siddhartha’s (who later became Buddha) horse who was held in very high esteem. Post time for the Woody Stephens is 3:22 ET. Kanthaka breaks from post 8 of 12 with Flavien Prat up.